This is a year-round open air market featuring 100% local produce from farms located in Wahiawa and the North Shore. For a smaller market it has a wide range of veggies, fruit and herbs because of Wahiawa’s deep agricultural roots. Also in steadfast attendance is Peterson Upland Farm, selling their fresh eggs. Also, Honda Tofu brings a fresh batch of tofu every week that sells out fast so come early. Honda Tofu is based in Wahiawa and has been operating since 1917. It is currently the oldest tofu maker in the U.S. and they still makes their tofu by hand — from grinding soybeans (non-gmo) to packing the soft blocks for selling. Amazing. 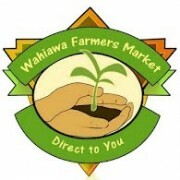 This market is produced by the non-profit, community organization Wahiawa Community Businesss Development Organization, and is run mostly by community volunteers. It proudly accepts EBT, a partner of GreenWheel Food Hub.